Happy New Year, friends. I’m putting all of my oomph and spirit into this year and I have strong feelings that this will be a special one for us all. So with that, I’m writing 12 of my goals for 2012. I look forward to sharing these with you throughout the year. I think we’re going to have a lot of fun. Focus on what I love and do it more often. Whether at my job or at play I want to find joy in my work and product. And if I don’t, then I have the power to change it. Take care of my mind and my body. Do yoga often. Drink more water. Stretch. Strengthen my shoulder. Reflect. I want to be as healthy as I am now for my whole life for myself, family and friends. Cook my food to-do list. Why haven’t I made my own pasta yet or chocolate hazelnut macarons? I want to take advantage of my mixer, dutch oven, cookbooks and all of my kitchen toys to make new (more challenging) things. Entertain. Because I want to share all this great new food with people. So come on over, why don’t you? I’ll cook. We’ll have tons of fun. Collaborate. There are so many talented bloggers and friends I’d love to work with this year. Let’s make something pretty together. Read more. Thank goodness for my new Kindle Fire. Book Club will actually be Book Club this year. I’ve also been shamefully out of know when it comes to current events and politics. I’ll get back to reading the news every day and be informed and ready for this election. Embrace turning 25. I have until April to be ok with this number. I feel confident I’ll get there. Know my money. I want to be more aware of my finances. This means getting a credit card (and of course paying it all off on time! ), knowing what to save on, and knowing what to spend on. Some big purchases are worth it (like maybe the new rug or desk or coffee table I can’t stop thinking about). Give back. I will donate more clothes, volunteer more often with my favorite DC causes, shop local, smile at strangers. Let’s all try to get along and make this world a better, more beautiful place. Treat myself and treat myself well. The past few years I’ve been very focused on the success and well-being of others. While this is in my nature and I will never stop doing this, I want to remind myself that I should be doing this for me too. I deserve it. Take risks. This is my year of risk taking, a very un-Nikki thing. But I’m determined to do it because I know it will result in great things. So cheers to 2012! What are you looking forward to? Posted January 2, 2012 in Life by Nikki. I love this list. I’ve been struggling to verbalize some of my resolutions and in many cases you’ve hit the nail on the head. Here’s to 2012! Know my money is something I need to do, too. Great resolution list. Happy New Year!! Love your list. Cheers to 2012. May it be your best year yet! Such a great list! I absolutely need to drink more water and stretch more often. My favorite on your list is “treat myself and treat myself well.” I will be adding this to my list as well! Also–homemade pasta is WELL worth it! I think I’m going to treat myself to the KA pasta attachment for my new toy. MUCH easier than rolling it out by hand, which is what I’ve resorted to in the past. Love love love your list!! I share many of the same resolutions. Happy 2012 sweetie! Your list is very inspiring! I also want to entertain more this year and stop pushing things off on the “someday” train. (Someday I’ll volunteer, someday I’ll get organized, someday I’ll change my wardrobe . . .) Taking risks is what life’s all about, even when it’s terrifying. 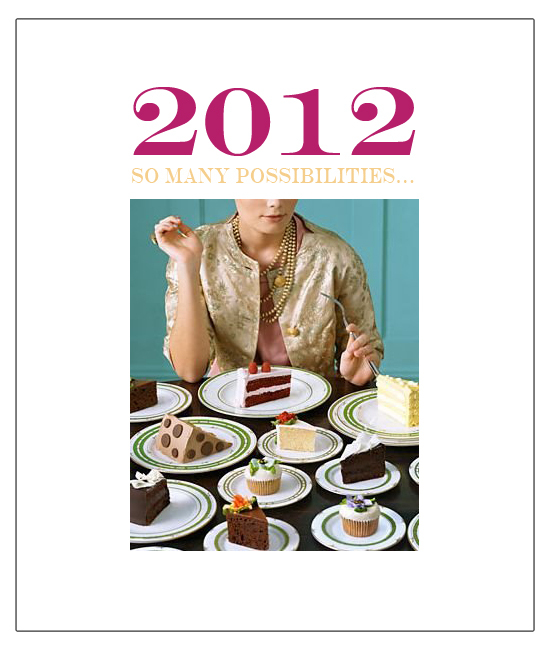 I hope you accomplish everything you’d like to in 2012!